In early spring of 1984, I was awakened in the middle of the night by a phone call from William Albright. He told me that our mutual friend, the composer George Cacioppo, had died. A few days later Syd Hodkinson and I flew to Ann Arbor to attend George's funeral at which time some tentative plans for a concert honoring George's life in music were made. During the summer, I wrote the Four Fold Heart Sutra as a contribution to that concert, but due to various difficulties, it could not be performed. 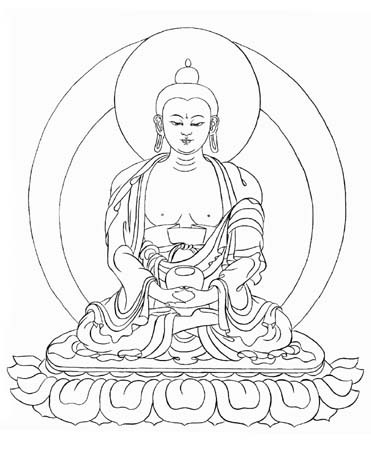 I chose to commemorate George by setting the Heart Sutra, an important and well-known Buddhist text. It is recited daily in certain branches of Buddhism, notably Zen, and is also chanted at funeral services. The text is a short but elegant summary of the other much longer Prajna-Paramita sutras originally associated with the Madhyamika school of Indian Buddhism (circa ce. 150). What it lacks in length, it makes up in depth; for it has inspired literally thousands of commentaries written over the last two millennia. Indeed, the sutra presents the heart of Buddhist wisdom, in as much as such wisdom can be put into words. In some respects it is a critique of certain (earlier) Buddhist doctrines that place too much emphasis on conceptual thinking or empirical concepts as an aid to reaching enlightenment. Rather it stresses the functions of shunyata (emptiness) as the basis of wisdom. Like many sutras, it ends with a mantra, or spell, which if recited repeatedly will help develop a receptive mind to spiritual growth. While my setting is designed for concert use, it employs chanting which reflects the sutra's presentation in a more ecclesiastical environment. The text up to the mantra is set four times, each time with slightly more elaboration by the chorus, piano, and percussion. The last section uses the mantra which slowly unwinds the basic material from which the piece is made. This material is based on all-interval tetrachords, four-note chords which contain each basic musical interval exactly once. I felt these chords in their special construction reflected the spirit of the text. Moreover, I know George liked these sounds and I think he would have been amused at the chorus's role in my piece, one found in some of his own music, most notably, The Advance of the Fungi. None take birth or die. nor even act or sensing. not even wisdom to attain. come to full and perfect wisdom.